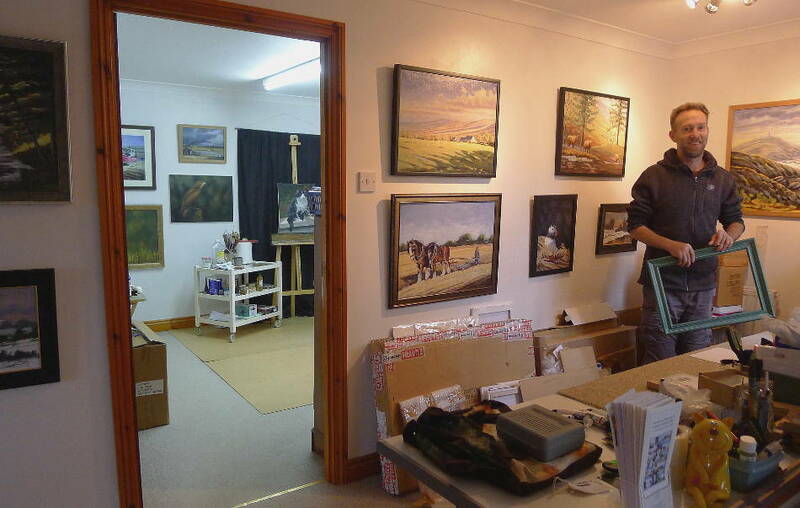 Chris's home and art studio in Cilgerran. 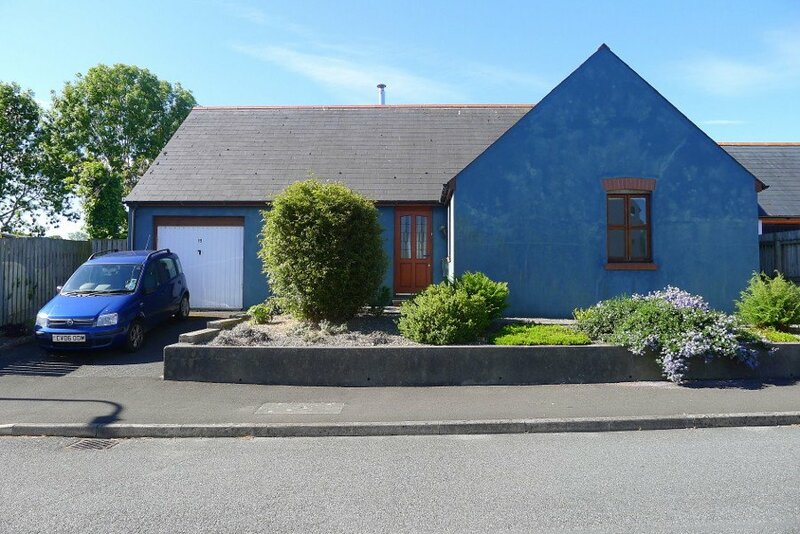 I live and work from my home and art studio in Cilgerran, a beautiful village on the northern border of Pembrokeshire between St Dogmaels and Cenarth, 3 miles south of Cardigan, in West Wales, in the UK. The village stretches along the south bank of the River Teifi, a river well known for salmon and sewin, and where coracle fishermen still fish. Cilgerran aerial image copyright Visit Pembrokeshire www.visitpembrokeshire.com. 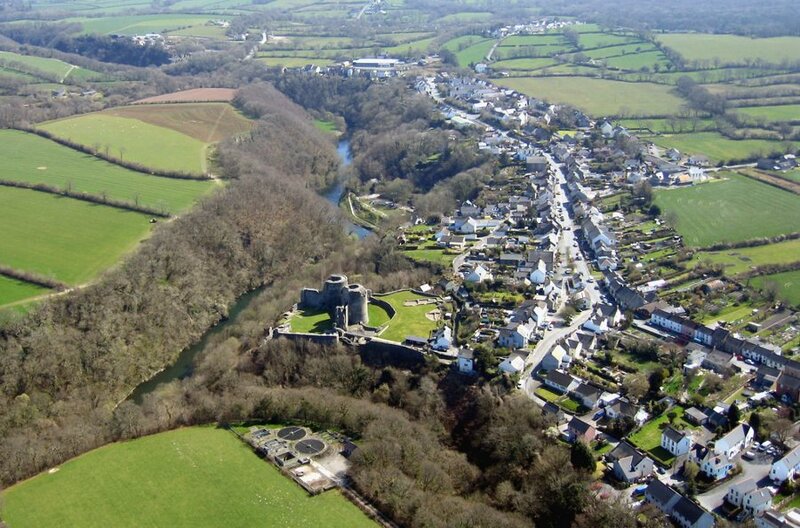 Cilgerran has a famous and picturesque castle, which dates back to 1100 and stands overlooking the River Teifi. The castle is now owned by the National Trust, and you find out more about Cilgerran castle here. To the west of Cilgerran village is Cilgerran Gorge where 3 slate quarries once flourished, with quality slate being exported through the nearby port of Cardigan. 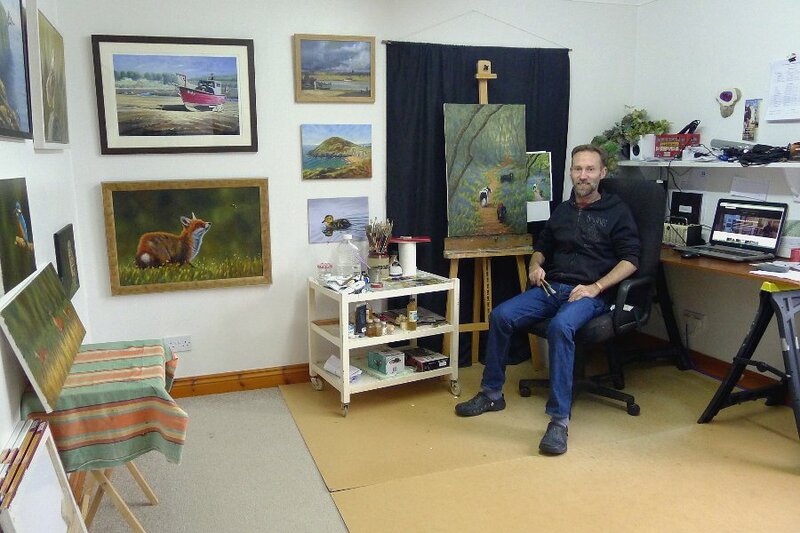 My studio is my favourite room in the house and where I spend a lot of my time. Well, it's actually two rooms as you can see in the picture above, the area on the right is where I pack paintings and prints ready for shipping or delivery, prepare canvasses for new paintings and also a general area where I can do all the things that need a little more room, and a nice flat surface. Through the doorway is my main studio, and where I have my easel and my computer, and where I also display more of my work to visitors. 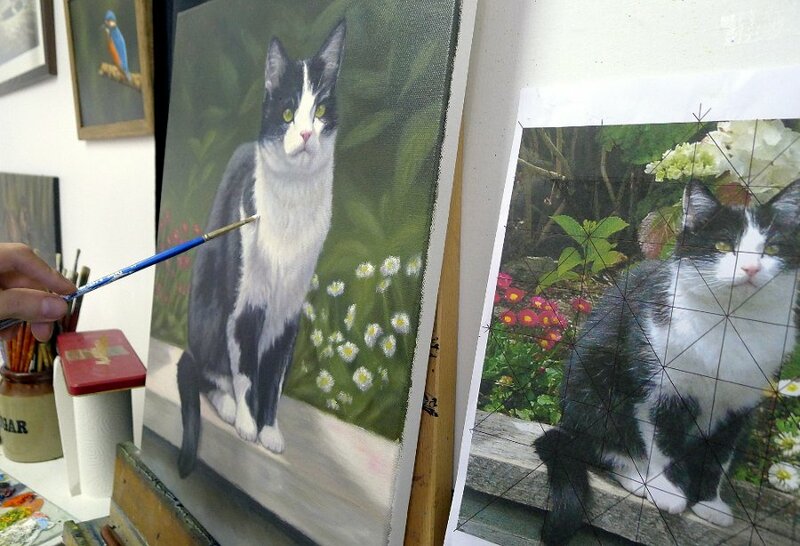 Work in progress pet portrait of 'Ben' on the easel. I work on my easel at the far side of my studio. When I'm working I have a trolley next to me with all the brushes, paints, thinners and mediums I might need for that painting, and it also holds a large glass palette that fits snugly on top. I used to use a small table with all my equipment on it, but my painting trolley has wheels and is much easier to move around my studio. Inside Chris's studio painting and computer area. Beside me when I'm painting I have my desk, my computer and all my paperwork, records and files. There is nice view out of the window from this area of the studio, which helps when I spend long hours working on paperwork or on the computer. Sometimes my neighbours even see me working and tap on the window with a cup of tea for me - I have lovely neighbours. Chris's garden, looking south across beautiful Pembrokeshire farmland. Cilgerran is a rural village surrounded by farmland, and I'm lucky enough to have wonderful views from my garden across fields of horses. I have a low maintenance garden where I grow a few vegetables, French beans, onions, tomatoes, ..and my favourites, strawberries. The horses are in the field all year round and it's always a thrill and it's always very relaxing to watch then wandering about munching in the grass.